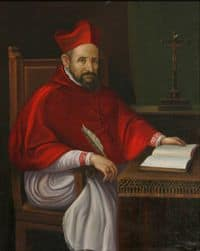 St Robert Bellarmine was born into a noble but impoverished family at Montepulciano, Italy. He was a bright student and at 16, entered a novitiate College in Rome. He then progressed to the Universities of Padua and Leuven. Following his ordination, St Robert began a long teaching career at Leuven University. He became a well-known Jesuit professor and preacher. St Roberts works and achievements led to two Popes, Sixtus and Clement, choosing him as a respected papal theologian to help them guide the Church. He was appointed Rector of the Roman College and a Cardinal. St Robert is a Doctor of the Church. His Feast Day is the 17th September. He is the Patron Saint of Bellarmine University, canon lawyers and catechists. Pray for us that we will listen to the teachings of Jesus.